Since Carol Danvers went the entirety of her solo debut without a love interest, MCU fans have taken the liberty of providing some suggestions for Captain Marvel’s first onscreen partner. The latest Avengers: Endgame trailer, for instance, had the internet shipping Carol and Thor, but in a new piece of fan art, the case is made that the MCU’s most powerful hero might instead hit it off with one of the God of Thunder’s Thor: Ragnarok co-stars. While Valkyrie has yet to show up in any of Endgame’s promotional footage, it’s currently looking like a safe bet that Thompson’s character will be making an appearance. For one thing, we know that Thor’s warrior friend is getting her own action figure as part of the new film’s toy line. On top of that, Thompson mentioned in a tweet earlier this year that she’ll be appearing in a movie this April. Since she hasn’t been officially announced for anything else next month, it doesn’t feel like a stretch to say that she’s probably referring to the Avengers: Infinity War sequel. 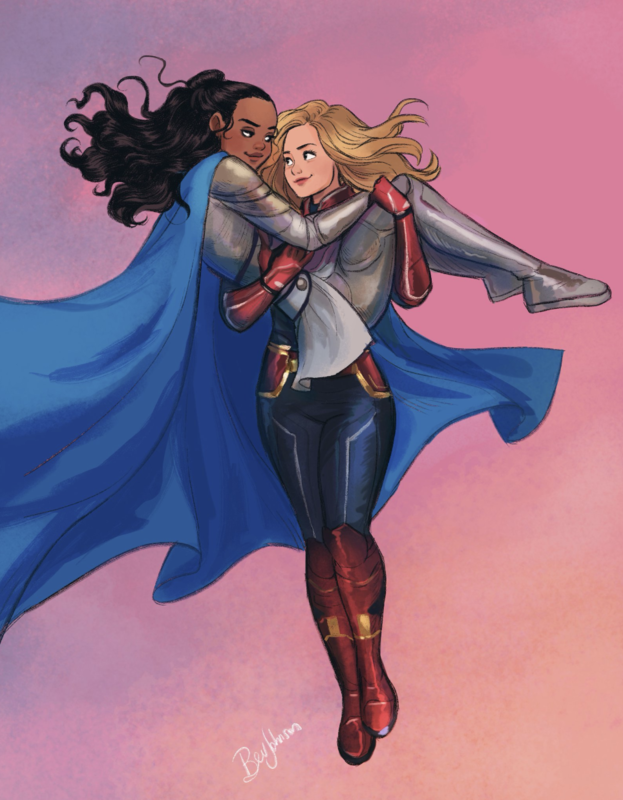 As for whether or not the pictured romance might happen, that remains to be seen, but for what it’s worth, Marvel Studios head Kevin Feige was almost certainly referring to Valkyrie when he claimed last year that a current MCU character will be written as openly LGBT. It’s not much to go on, but we’ll see if Avengers: Endgame has such a pair-up in mind when the film hits theaters on April 26th.